Research excellence and innovation at York University are flourishing. 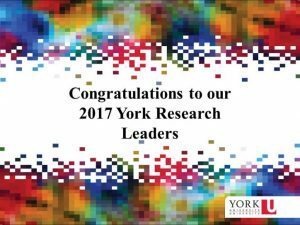 York University’s researchers − recognized leaders and pioneers in their fields − are deeply committed to advancing innovative research projects across the vast spectrum of disciplines for the social, economic, cultural, environmental and other well-being of society. We encourage everyone to read this year’s research leaders booklet on the VPRI website.